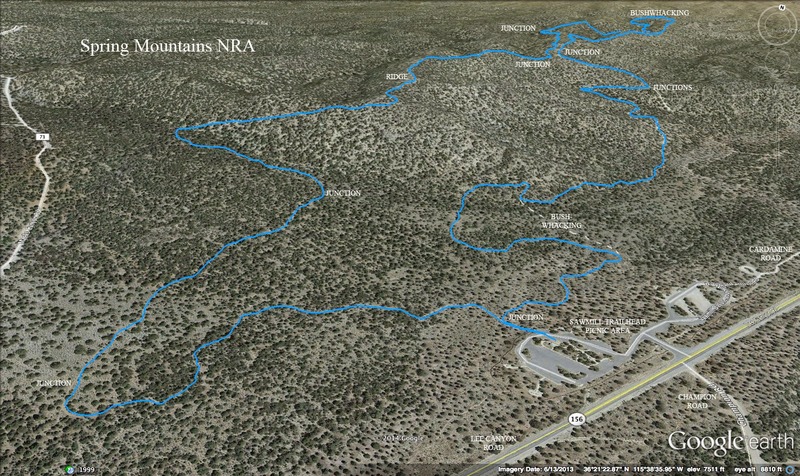 This morning, twelve hikers found the parking turnout on Deer Creek Road that is across from the mouth of Wild Horse Canyon in the Spring Mountains NRA. The first thing we noticed was that an orange cone had been placed in the middle of the old road that swings by the canyon. (Perhaps, the forest service would prefer that you not use that road for parking.) We hiked up the road toward the North Loop Trailhead but turned up to the right early on an old trail that took us to the North Loop via shortcut. It was a beautiful Sunday on a holiday weekend and no one was really in a hurry as we hiked the trail up and up. Of course, we gathered again at the North Loop meadow where there are at least two shelters built with bristlecone limbs found scattered about on the ridge. Our next gathering was not scheduled until we reached Raintree so the eleven hikers got somewhat spread out while they tackled the switchbacks, turned the high point corner then dropped down to Raintree. Raintree is named for a tree in a movie for some unknown reason. 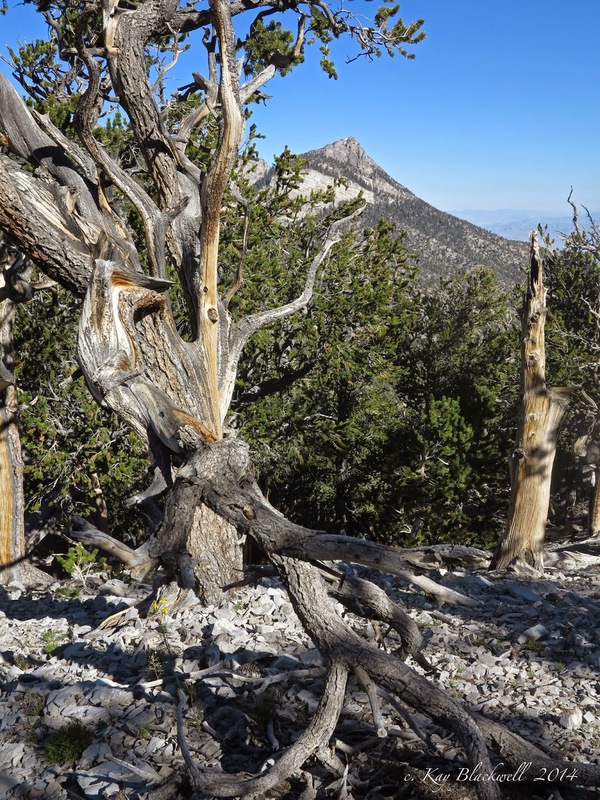 However, it is an old bristlecone (maybe 2000 years old?) that still thrives in this saddle area at the base of the Mummy's Toe cliff. We stopped here for our morning snack break. It was still early so there wasn't a lot of munching going on. The North Loop Trail swings around to the left at the large old tree. But, there is a trail forking off to the right as well. This trail leads to Mummy Springs and continues on to Mummy's Toe. 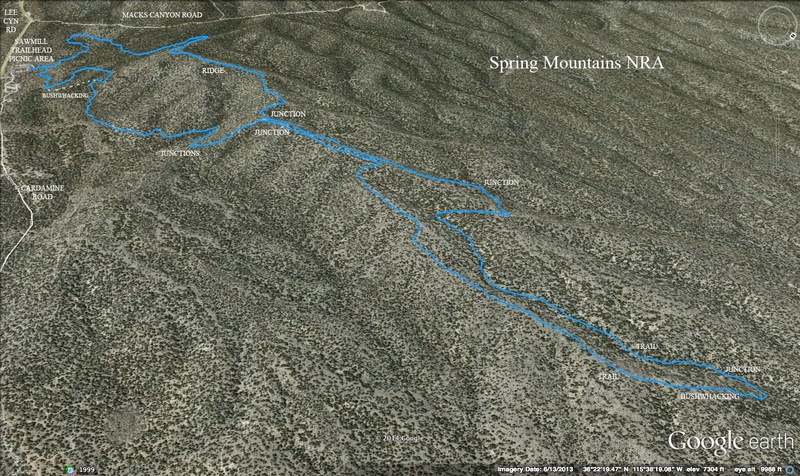 So, after our small break, we started hiking out toward Mummy Springs. 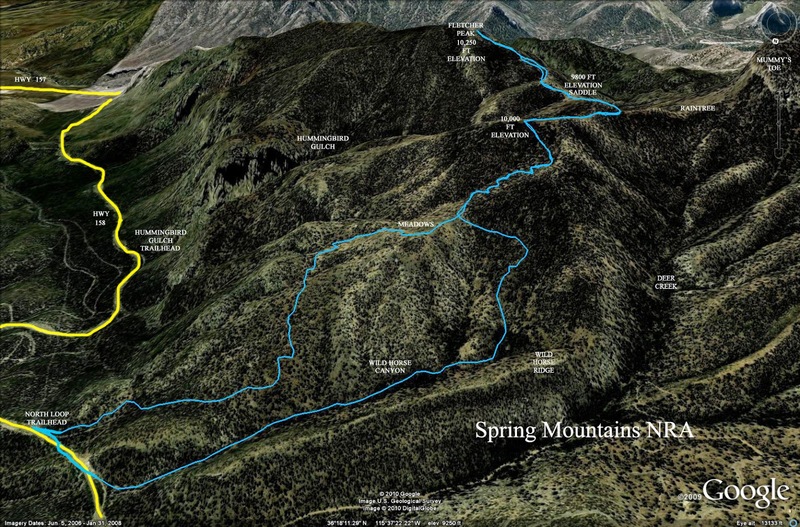 Even though this hike was named Mummy Springs Loop, we never actually arrived there! 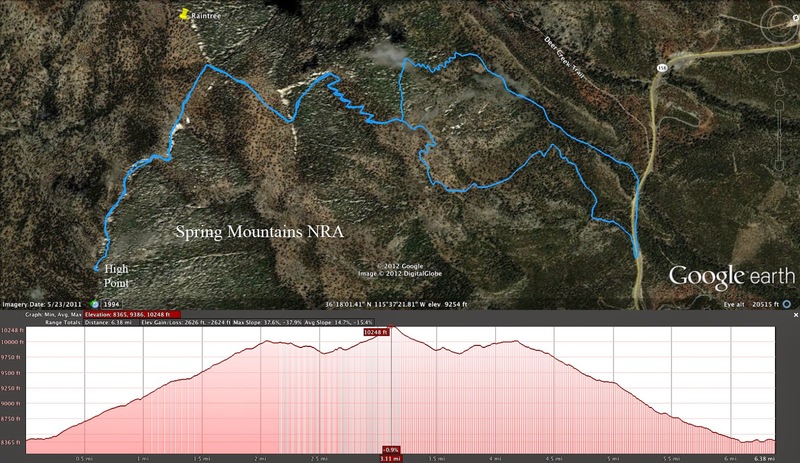 About a tenth of a mile before we would have reached the short spur trail that leads to the springs, we turned to our right onto a sharp ridge. At the end of the ridge, there is a substantial campsite built with a fire ring and log seating. We hiked through and followed a trail that led us literally over the edge into the abyss! Okay, it really wasn't that bad but it was quite steep as we carefully concentrated on making it down to our right into the messy canyon below. There is a trail in this area but it was not easy to follow since it probably isn't used very often. When we made it into the canyon wash, the fun had only just begun! There were many fallen trees to step over and find our way around. And, there were a couple of rock "steps" to find our way down. 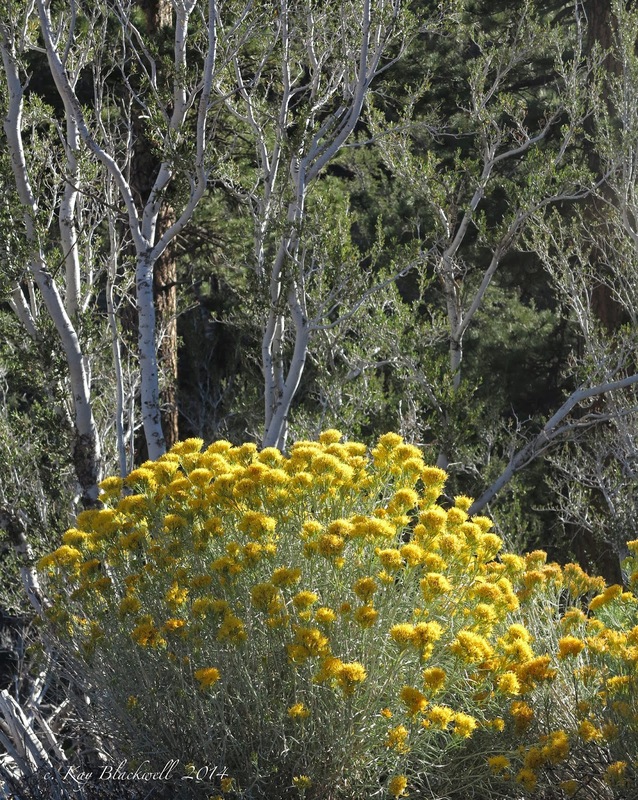 The Sun City Anthem Hiking Club and the Around the Bend Friends Hiking Club got together today for a potluck picnic at the Sawmill Trails on Lee Canyon Road in the Spring Mountains NRA. We offered two hikes to work up appetites, a shorter one and a longer one. This entry covers the longer exploratory hike attended by thirteen hikers. After we circled up and introduced ourselves, Chris led the longer hike out through the regular trailhead. From there, we hiked up to the ridge which affords mountain views on both sides. The view in front of us gave us glimpses of the desert playas of the nearby military base. 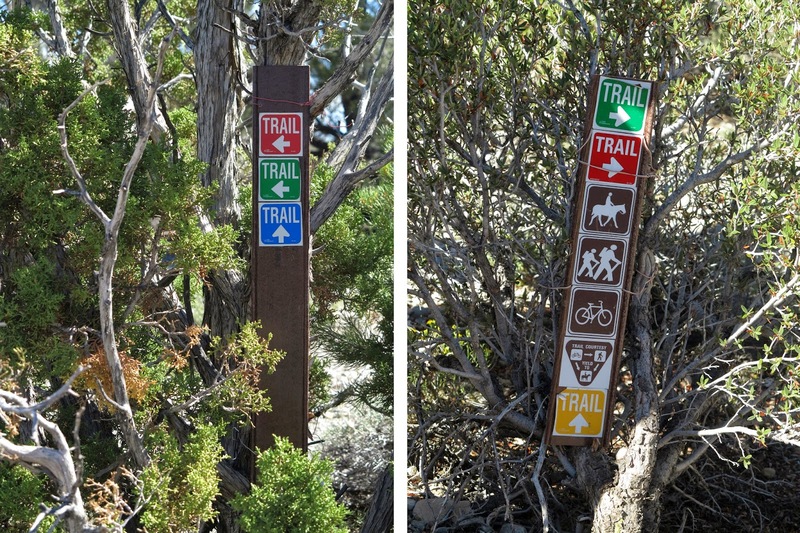 The Sawmill Trail system is marked by color coded signs. These can be very confusing since there are so many different trails and the signs are not always present nor complete. 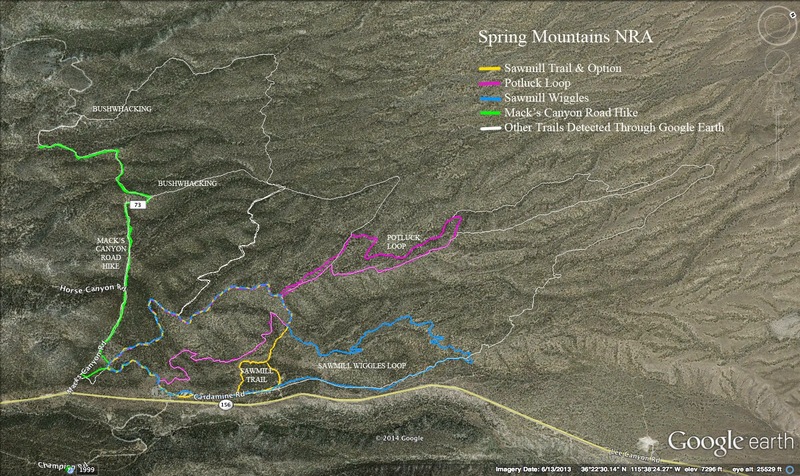 As a result, some of our club members have begun hiking and memorizing and mapping some of these trails. Today, we took a left turn down the second trail that was marked green and red. We soon passed another junction and continued straight. The trail that turned down to the left had been previously explored to no avail as yet. Our trail led up and over a ridge to the right and started down a nice small canyon. The wooded shallow drainage offered a bit of shade on this very warm late summer day. Nevertheless, we were all prepared with plenty of water, wide-brimmed hats and sun block. We stayed in the drainage for a little over half a mile then Chris started feeling that the trail would never turn back to where we wanted to go. After later checking on the map, it was clear he was right. Eventually the trail would go where we wanted but the potluck was waiting so the trail would have to be revisited at a later date. After our half mile, we bushwhacked up to the ridge to our right on an easy slope. As expected, we found a ridge trail, abeit old and untrodden, that led us back in the direction of the main trail that we had turned off of a while back. The ridge trail was followed easily and, soon, we realized that this was a ridge trail that we had checked out on a hike last year. We ended up at a familiar spot where we had once taken our snack break and happily returned to the main trail. We turned left on the main trail and followed the old Blue Tree Road down to a trail junction area. Here, the Sawmill Wiggles turns off to the left and our route for today turns off to the right. Following this trail, we headed back in the direction of the trailhead. The trail swings out at one point and Chris decided to go ahead and bushwhack down to where the trail comes in again. Maybe he was hungry! Anyway, we came into the picnic area where the other group was already putting the food out. All together, we probably had around twenty-five attendees. Thanks to all who brought food and had a great day! Absolutely Gorgeous! A Ghost Burro! Seven plus six plus one equals fourteen hikers on the trail to Fletcher Peak this morning. We had a slower group, a faster group and a solo hiker (read non-committal!) on, perhaps, our last hike to Fletcher Peak of the summer season. Due to the Carpenter One forest fire of 2013, Fletcher Peak became our "go to" hike for the summer of 2014. We have probably done Fletcher Peak just about every which way but loose. 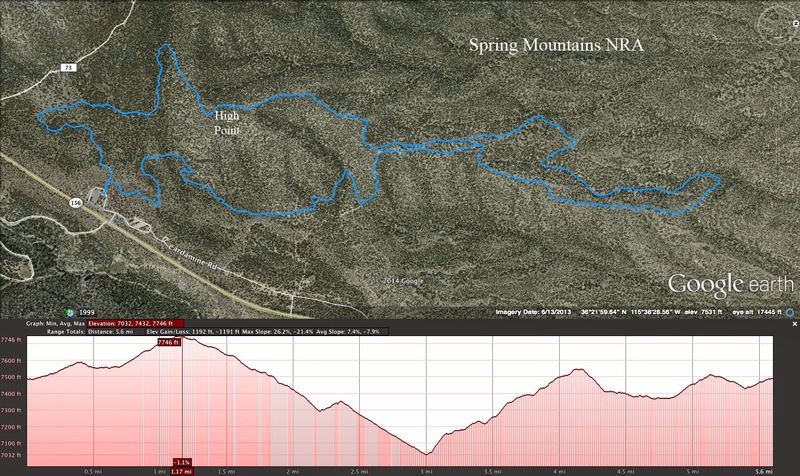 Today, it was a simple hike up the North Loop Trail and down by way of Wild Horse Canyon. The faster group reached the North Loop meadow at the same time that the slower group plus one was leaving the meadow. It didn't take long before we started up the switchbacks, too. By the time the last "fast" hiker arrived at the high point corner, the rest of that group had passed many of the other group. So, essentially, we were now one group. Fletcher Peak could be seen from the ridge that we hiked down to find its trail junction. We took a sharp left turn onto the peak trail, circled around and dropped steeply down to the Fletcher Peak saddle. 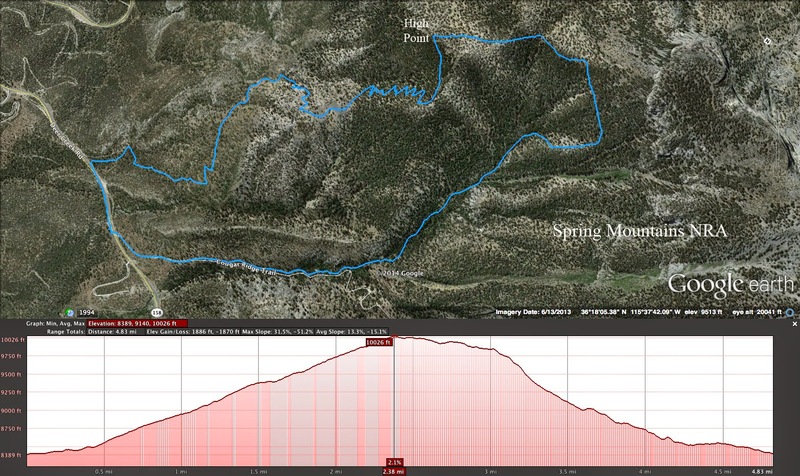 Although our hiking speeds varied, we were not too far from each other as we navigated the Fletcher Peak Trail down, up, down, up, down, and, finally, up one last time. The trail is well-marked since we are not the only hikers that have done this nice little peak a lot this summer. We all reached the peak and signed into the log book. There were, at least, two newbies in the bunch! Then, after a restful break, we started back down. 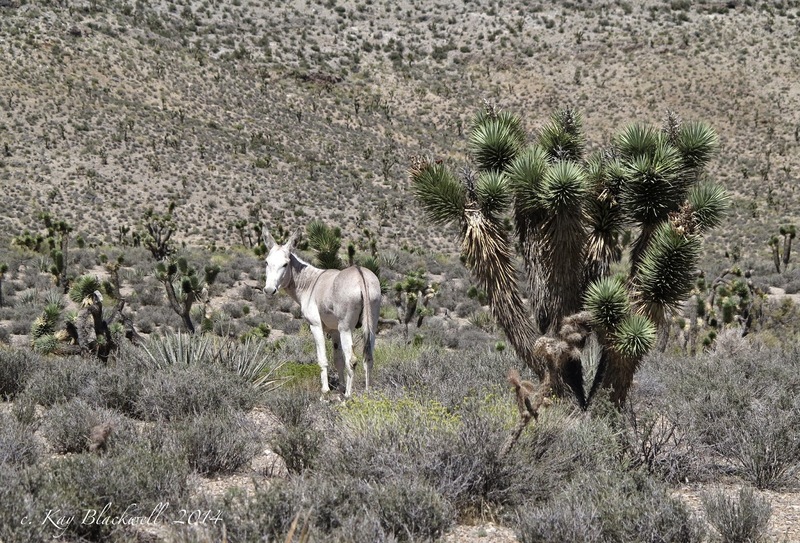 We retraced our steps to the North Loop meadow, then turned left onto the crossover trail for Wild Horse Canyon. 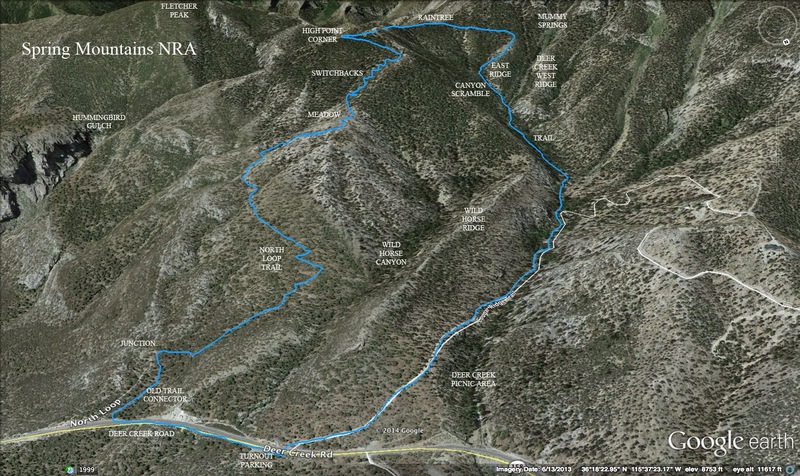 Down the steep small switchbacks and out through the pleasant canyon, we hiked. A short walk up the paved highway was required to return to the North Loop trailhead and our cars. Beautiful day and good workout.